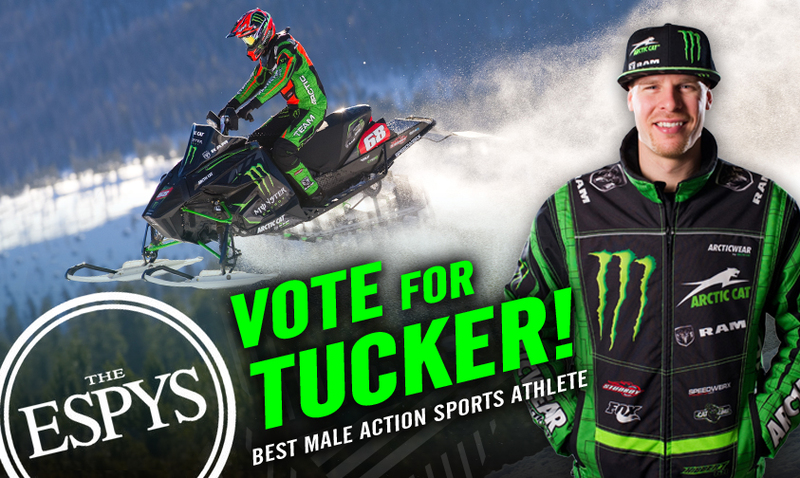 Tucker Hibbert’s record-breaking snocross season just earned him an ESPY (Excellence in Sports Performance Yearly) Award nomination in the Best Male Action Sports Athlete category. It’s Hibbert’s third nomination and if he wins, he’ll become the first snowmobiler in history to take home this prestigious award. This past winter, Hibbert won 13 of the 17 ISOC Pro Open final events, recorded his 100th Pro National win with a jaw-dropping come-from-behind win in Deadwood, SD. and won a record-breaking eighth consecutive X Games gold medal. Alongside Hibbert, Supercross champion Ryan Dungey, skateboarder Nyjah Huston, snowboarder Mark McMorris and freestyle motocross athlete Josh Sheehan were selected by a panel of judges for their standout performances in action sports. Online voting will determine the winner. The 2015 ESPYS Awards show will be broadcast live on ABC Wednesday, July 15 at 8 p.m. ET. One vote per web device allowed now through Wednesday, July 15. The 2015 ESPYS, hosted by Joel McHale, are LIVE on ABC Wednesday, July 15th in downtown Los Angeles. The flagship event is the one night where the sports world joins together to celebrate the best moments of the year.